Got a sweet tooth? Well, so does your Flour Beetle! 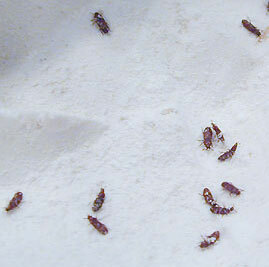 Seems like the flour beetle likes chocolate as much as you do! That's how they are usually discovered.. 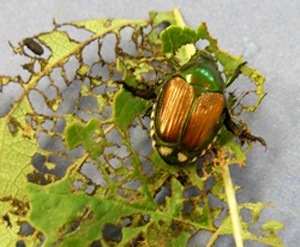 If you have seen this beetle roaming around your pantry chances are they are getting fed real well by the grains, nuts, spices, flour (of course), and even dust you have stored in there. Its large mouth allows this beetle to like it's going out of style, what's worse is that it's not uncommon to find this reddish-to-brown critter in your pantry trying to make up its mind about what it's going to eat! The best way to stop them from becoming another child of yours is by doing some simple house cleaning. 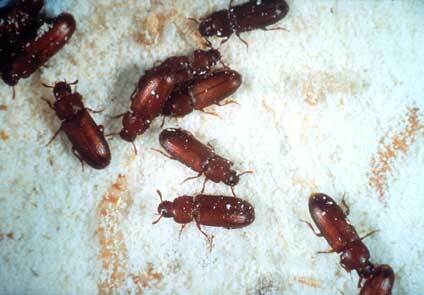 Same method applies for both types of beetles, the red flour beetle and confused flour beetle. 1. Start by locating the source. These beetle like hanging around all over most products in your pantry, locate the infested product and dispose of it away from your property. 2. Cleaning Time. This step is no big deal but it will take you some time to get do, we always recommend cleaning because it keeps most pests away. Empty out your pantry, kitchen cupboards and other food storage areas, grab a vacuum, warm soapy water, and a disinfectant you trust. First vacuum everything, then thoroughly clean and disinfect all food storage areas. 3. Before you start re-storing your pantry you are going to have to inspect them each item thoroughly. If you have unopened boxes and other containers go ahead and open them and inspect them well. Items like sealed cans should not be a problem, obviously. 4. Do you have pets? Yep! it is always a good idea to keep their food in tightly sealed containers too. Bugs don't discriminate against foods. I know that our frustration with pests can drive us immediately want a solve the problem by nuking them to smithereens, but believe me, there's is no excuse to using chemicals around your kitchen and places where you store the food are and your family is going to eat. No chemical solution for this beetle.